We see squirrels all the time, but have you ever just stopped and thought to yourself, where are all the baby squirrels? You can look around and see a squirrel in almost every tree, and every park, and now in this article you are going to find out when squirrels have babies, how long they stay with their mother, what to do if you encounter a baby squirrel by chance and why,most of the time,you don’t see them. Squirrels usually have 2 litters per year. The first litter that they have is born between the months of February and April, and the second litter that they have happens between the months of August and September.Usually a litter of squirrels isn’t very large, on average the female squirrel will have between 2-5 offspring. 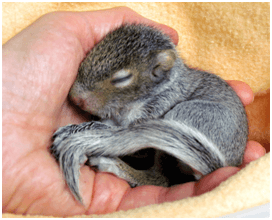 The baby squirrels are born furless and helpless, just like most other rodents. Squirrels are raised primarily by the mother because she forces the male squirrel to leave so she can raise the offspring by herself. Baby squirrels also rely heavily on their mothers very rich milk to grow strong and healthy. Most babies in the first litter will leave the nest around April and sometimes as late as May. By this time, the babies are strong enough and fluffy enough to leave the nest. Babies born in the second litter will leave the nest in late summer. Because winter is coming these babies are at a higher risk of death. 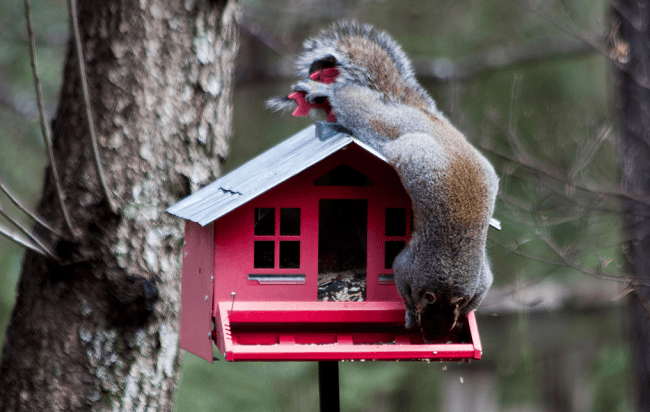 The smaller baby squirrels can’t tolerate the cold and therefore will find it harder to find food and shelter for them to survive throughout all of winter. In the rare case that someone actually finds a baby squirrel they should be careful, and make sure that the baby is actually orphaned before taking a more hands on approach. If someone does decide that the squirrel needs help they should be weary of a couple of things. First off they should be cautious of fleas and other parasites. Squirrels are known to carry such things and it wouldn’t take long before they are spread to someone if they come into contact. You wouldn’t want to bring anything like that home to your family. 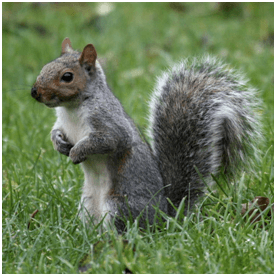 Secondly squirrels claws allow them to run directly up trees; meaning they are sharp, and dangerous in some cases, although it may be by accident the squirrels claws will pierce through skin and cause some serious damage. Perhaps one of the more important reasons to leave the squirrel alone is that once it becomes use to being taken care of,(past where a squirrels mother would usually take care of it) it will become dependent upon the host and will have trouble if its ever released back into the wild. Keeping the squirrel past an old age is dangerous because as it grows it becomes more of a pest then a pet. The pictures below you will have the chance to see the difference between a baby squirrel and a full grown one. In conclusion, squirrels have babies twice a year: once in the spring and once in late summer just before winter. The babies stay with the mother for around 8-12 weeks, and once they are strong enough will leave the nest. That is the reason we never see a baby squirrel, its because by the time they leave the nest they are already covered in fur and look almost identical to all the other squirrels running around. In the rare case you want to take care of a squirrel be cautious of the following. Fleas, parasites, and their sharp claws. Also knowing all of this information gives people a good idea of when squirrels are being born. This can be useful to environmentalists because they can make sure companies focused around cutting trees can be cautious that they do so in the seasons that will have a less of a risk of killing so many nests and the babies themselves.